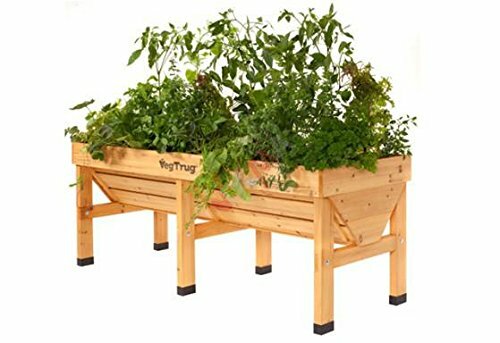 VegTrug Wooden Raised Bed-inch 70.87 (180 cm) the trough from England! ideal for those who have a large garden but not apply to fresh herbs from the People garden balcony or terrace raised bed is a real eye-catcher-Aufzuchtplatz ideal for salad, herbs and vegetables Payment. with the length of 1.97 yrd (1,80 m) It also provides for small balconies and terraces with plenty of space for sundries plants. VegTrug High Quality Wooden Raised Bed 70.87 inch (180 cm) stands for a long service life and optimal Ertrag. to benefit from the advantages of a stable Hochbeetes. design made from weather-proof waterproof with fleece, cedar is the wood of each trennt. Pflanzbereich and also the need for awkward bending or kneeling a thing of the Past; the comfortable working height is a blessing-therefore also suitable for wheelchair users and the elderly, perfectly suitable for your plants receive more light than on the floor, snails, pests, such as the way it was made almost impossible to the consequences are improved growth and higher erträge.